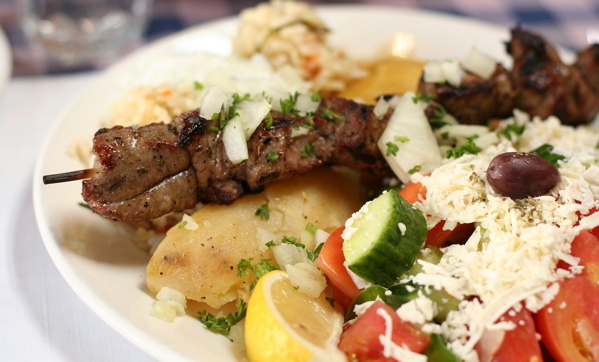 Forget the Olympics; the Greeks’ greatest contribution to Vancouver might just be the cuisine. So skip the sub-par souvlaki stands and store-bought hummus, and enjoy this Mediterranean food the way it’s meant to be eaten: fresh. Don’t miss the roast lamb at the Prinianakis family’s Main Street eatery, which also doubles as a venue for live roots music. An unlikely pairing, but it works. Mains, $13 – $18. 4210 Main St., 604-709-8555. No blue and white motif and fake ivy here. This stylish Kitsilano spot classes up traditional Greek food with dishes like sockeye salmon over spanakorizo and halibut cheeks over horta. There’s a great selection of Greek wines and ouzo to wash it down. Mains, $12 – $22. 1835 West 4th Ave., 604-568-2929. The reasons for those daily lineups down Davie Street? Cheap, authentic Greek grub served up in huge portions. It’s a prime place for boys’ night; not ideal for a date. Mains, $10 – $12. 1124 Davie St., 604-683-2555. This Parthenon-inspired restaurant feels like something you’d find on Samos, the Greek island the owners call home. Don’t bother reading the menu; just order the city’s most sensational souvlaki. Mains, $16 – $30. 3605 West 4th Ave., 604-731-2712. This cozy spot just off Granville Island is ideal for an intimate dinner. Share an authentic Greek platter (souvlaki, moussaka, etc. ), or go solo on the slow-cooked, melt-in-your-mouth lamb. Mains, $14 – $20. 1830 Fir St., 604-736-9559. Image courtesy of Geoff604 on Flickr.